Noiseless, Maintenance free & high speed machine. * Depending upon Material's properties and screen size. 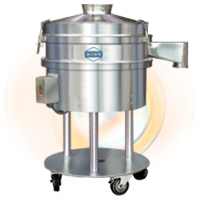 Vibro sifters, also known as safety screeners, Vibrating shifters, Vibro sieves, Check screeners or Control sieves are used to ensure the correct product quality of powders or liquids which is achieved by removing oversize contamination. Fluidpack offers Accura Model Vibro Sifter (cGMP) in 2 models- ACRA / SFT/20” and ACRA/SFT/30” providing provision for variable dimensions to be accommodated. The machine is designed compact and the portability provides great ease of use and storing. Its noiseless operation at higher speeds make it suitable for long hour run. The machine has continuous feed system thus providing high output rate. FLP models and Multi dacker Model also available.